The Oakland planning department quietly proposed zoning changes that would greatly benefit a politically connected developer in the heart of First Friday. The proposed zoning changes would make it easier for Signature Development to build a large mixed-use project across the street from the company's Hive development in Uptown. The Oakland Planning and Building Department recently attempted to quietly push through changes to the city's zoning code that would greatly benefit a politically connected developer who has acquired a big chunk of real estate in Uptown Oakland, right in the heart of First Friday, the Express has learned. Planning staffers buried the proposed zoning amendment in a six hundred-plus page document amid other proposed changes that they described as routine and neutral efforts meant only to "clean up" Oakland's planning code. But the zoning change, which underwent no public scrutiny before the planning department recently proposed it, would greatly increase the value of property recently purchased by Signature Development Group, a major Oakland real estate company run by Michael Ghielmetti, and would make it easier to build a large development project between 24th and 25th streets near Broadway. "There seems to be a blatant disregard for the community," said Hiroko Kurihara, founder and director of the nonprofit 25th Street Collective, in an interview. "The zoning changes that were proposed at the last minute ... left even members of the planning commission scratching their heads." Planning department staffers proposed the changes publicly on October 16, just five days before asking the Planning Commission to approve them. The proposed zoning amendments would allow Signature to erect buildings of up to 85 feet in height in an area now populated by one- and two-story structures. 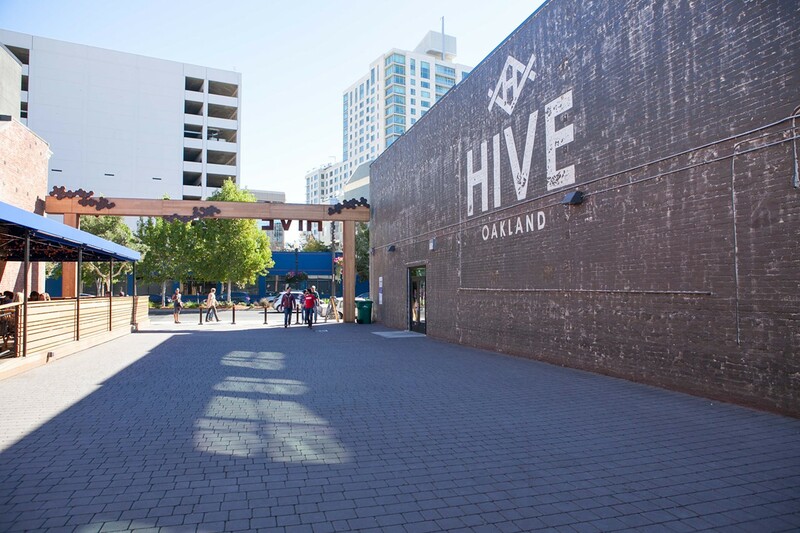 The proposed changes would also allow Signature to build a large mixed-use development, including housing, just across 24th Street from the company's existing mixed-use development called the Hive. "Why is the City of Oakland changing zoning and height variances only for these properties that have only recently been purchased, or are soon to be, by Mike Ghielmetti?" said Cory Gunter Brown, an artist who lives in the neighborhood, in an interview. "If the city is asking for these things, then they're acting as a representative for his companies." In an interview, Ghielmetti insisted that he has no specific plans for new projects in the neighborhood. He also said he wants to talk with members of the community before making any moves. And he said he did not ask the city to make the zoning changes on his behalf. Ed Manasse, the strategic planning director for the City of Oakland who presented the zoning changes at the planning commission meeting, also said in an interview that Signature and the city did not coordinate on the proposed zoning changes. "The city is not working with Signature," Manasse said. However, according to maps drafted by planning staffers, the proposed zoning changes overlap exactly with real estate that Signature Development has already purchased and is in the process of acquiring on 24th and 25th streets between Broadway and Telegraph Avenue. The proposed zoning change was item 38 in a package of 42 complex proposed amendments to the planning code, all crowded into in a 617-page document. Planning staffers withdrew the proposed changes following a public outcry at the October 21 meeting, but the department is expected to bring back a similar proposal in the near future. In the tight-knit Uptown neighborhood where Signature is acquiring property, artists and residents are worried about the future of the area and of First Friday, Oakland's popular monthly art festival, and they said they want to work with the city and Signature to shape the area's development. But many residents feel that the planning department is instead working hand-in-glove with developers in a less-than transparent process to reshape their community. "I'm not anti-development," said Lonnie Lee, founder and director of Vessel Gallery located at 471 25th Street. "I understand and value development in cities, but I believe in responsible development that engages the citizens who are being affected." At the October 21 planning commission meeting, a lobbyist with business and financial ties to Signature Development pushed hard for the proposed zoning changes. Gregory McConnell, speaking on behalf of the Jobs and Housing Coalition, told planning commissioners that "activating Broadway is something that should go forward immediately." "If there's controversy about some issues with regard to the art community, that is something you should address and talk about at another date when there can be more dialogue between the city and the potential people who might develop given those changes," McConnell continued. "But right now, we strongly urge you to move forward." McConnell's Jobs and Housing Coalition is a developer-funded business lobbying group, and Ghielmetti sits on the organization's board. In April, Signature contributed $25,000 to the Oakland Jobs PAC, a political action committee that is also run by McConnell and is affiliated with the Jobs and Housing Coalition. The Oakland Jobs PAC pays the McConnell Group, a private company owned and operated by McConnell, for political consulting services. The Jobs and Housing Coalition also pays the McConnell Group $250,000 a year as an independent contractor to handle "administrative and government affairs" work, according to the group's tax returns. In addition, public records show that in August, Signature Development and Jordan Real Estate Investment, which partnered with Signature to finance the Hive, bought the ER Transmission building at 450 24th Street for $1.7 million. The property lies just across 24th Street from the Hive's Mason apartments. In an interview, Ghielmetti confirmed that his company bought the property. He also told the planning commission two weeks ago that he has options on other real estate in the area. Gunter Brown, who lives and works in a two-story warehouse located at 447 25th Street, right behind the parcel recently bought by Signature, said she only recently found out about Signature's plans to buy out half her block when a neighbor handed her a letter they received in July from a company called Bella Vista Land Advisors. According to the letter, a copy of which Gunter Brown provided me to review, Bella Vista Land Advisors is helping Signature acquire property, and has already secured agreements with four property owners to sell potentially seven parcels comprising the entire eastern half of the block between 24th Street and 25th Street. These include the Mitsubishi dealership on Broadway, and a large warehouse and parking lot in the middle of the block owned by Don Pigozzi which for years has served as a machine shop. The letter states "[Signature] would like to add your property to the project, if you are willing to sell." Signature Development built the Hive in 2013 on the block between 24th and 23rd streets along Broadway. Ghielmetti leased space in the Hive to a diverse group of tenants, including the Impact Hub and Omi Gallery, and many have praised his company for investing in the area. Signature also built 104 luxury apartments in the recently completed Mason at the Hive. Rents for a one-bedroom start at $2,835 — prices that many current residents in the neighborhood said they could not afford. There are no affordable units at the Mason. Commercial rents in the area are also rising rapidly. Kurihara said the 25th Street Collective will have to move out of its space at 477 25th Street in August 2016 when its lease is up. The landlord recently increased rent by 35 percent. The 25th Street Collective houses textile artists and helps them incubate small businesses. "What's happening wholesale in the city is we're losing our manufacturing," said Kurihara. "And it could hurt us all because it's a viable sector right now to bring communities out of poverty wages." Kurihara said she hopes Ghielmetti will work with the existing community of artisans in Uptown to possibly develop affordable housing and commercial spaces alongside what is expected to be more market-rate housing and restaurants like what already exist in the Hive. A similar proposal to rezone two parcels on Alice and Harrison streets, just behind a row of buildings along 14th Street went unchallenged at the planning commission two weeks ago, but the commission did not vote on the item. It's unclear what the advantages would be for a developer to have the new zoning, but several businesses that rent storefront space on 14th Street, right next to the parcels that would be rezoned, said that a developer recently contacted them and told them that nearby property would soon be turned into lofts. "Right now we don't feel like our city is working on our behalf to build a place for us in the future," said Gunter Brown. "My take away is: I need to keep talking with my neighbors and to get more involved in how policy is crafted in the City of Oakland and how we can have a voice in that."